Please contact us at info@churchhotel.com.vn for pricing policy and conditions. Launched in May 2010, the Dragon’s Pearl Junk was designed with adventure in mind. With 11 cabins.The newest and the largest of the Indochina Junk family, the three Dragon’s Pearl are modelled on the traditional Chinese junks that used to sail these waters.Whether you are dinning in the restaurant, lounging on one of the two sundecks or relaxing in the comfort of your cabin, you will be surrounded by the handcrafted teak and oak that make the Dragon’s Pearl wonderful sailing vesselsThis classic junk is ideal for parties for larger groups (up to 20 people) or even incentive groups. Alternatively book a berth and get to meet new friends as you cruise the bay. 1 14 Yes Yes Sea view. Deluxe Double or Twin 4 10 No No Sea view. 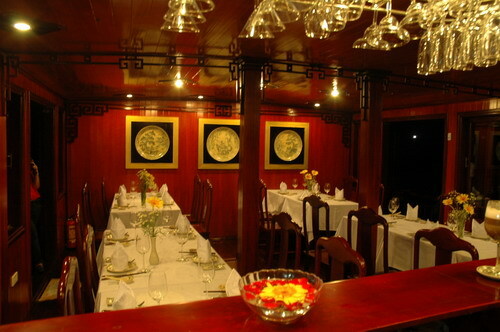 Bar & dinning room: 15m2 (in front of the boat), maximum 15 Guests.